La Châtaigneraie offers self-catering gîtes, apartments and bed & breakfast / chambres d’hôtes in the beautiful Languedoc region of the South of France. The flexible accommodation is ideal for groups of 2 to 28. Whether you are a couple seeking peace and tranquility, an extended family wishing to accommodate several generations, or a mountaineering club looking for adventure, we can offer the perfect venue! Situated in the heart of the Pyrénées, it is within easy reach of both sandy Mediterranean beaches and ski-resorts. The tranquil setting has breath-taking mountain views in all directions. 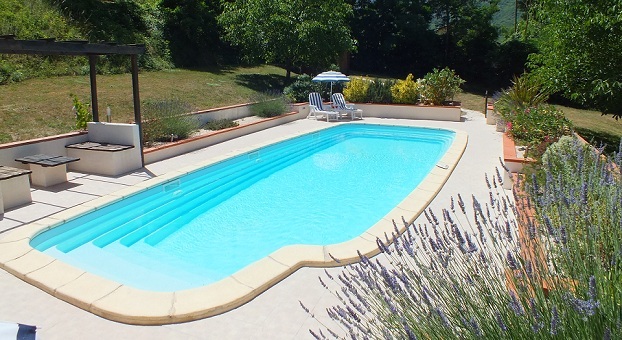 With two acres of landscaped gardens, swimming pool, boules court, gym and wifi, La Châtaigneraie offers the perfect base for a holiday with something for all the family. Exclusive Use bookings enjoy use of a large central kitchen fully equipped to cater for 30 people. Accommodation is bright, airy and well-equipped with en-suite facilities – a fantastic rustic location with contemporary style and comfort! It is just a short, scenic 10 – 15 minute riverside walk to the local bistro in the village of Sahorre. The famous spa town of Vernet les Bains is less than 2 miles away with a wider selection of shops, activities, thermal spa and restaurants. There are many local markets to explore and fêtes and festivals are a regular feature of village life. A daily boulangerie delivery ensures you can enjoy freshly-baked baguettes and croissants for breakfast every morning.Sahorre forms part of the Parc Naturel Régionel des Pyrénées Catalanes and this stunning area is steeped in culture and history with many of France’s most beautiful villages, including Villefranche de Conflent and Eus, located within a short drive. The area is a paradise for hikers with many miles of superb walks straight from the house. You will find a huge range of other sports and activities available nearby – from mountain biking to white water rafting – even the most active group could find a different activity for every day! Renowned as the sunniest area of France with a glorious 300 days of sunshine every year, La Châtaigneraie is beautiful all year round. Just 40 minutes from ski resorts and 45 minutes from sandy Mediterranean beaches we offer the best of both worlds. It is easy to reach by air, road or rail and well-served by low-cost airlines. We look forward to welcoming you to La Châtaigneraie very soon! Visit our Facebook page to see regularly updated photographs of La Chataigneraie and the surrounding area!